IOWA CITY – Home cookin’ for the Hawkeyes is always a good thing. Night games at Kinnick Stadium rejuvenate the team and the fan base. Night games for a rivalry trophy add a little extra nostalgia. 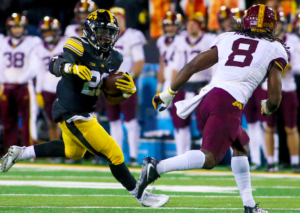 As you would expect, Iowa and Minnesota slugged it out all night long, but the Hawkeyes took command early and never looked back. 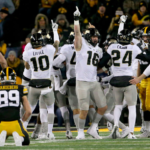 Iowa retained possession of the coveted Floyd of Rosedale Trophy with a 17-10 win over Minnesota on Saturday, the 13th Iowa win in the last 17 meetings. Coming off a lackluster offensive performance last week in Evanston, the Hawkeyes came out firing on their first possession. Going against the grain, the Hawkeyes elected to receive first after winning the coin toss. The Hawkeyes started the first drive with three consecutive completions to three different receivers and moved all the way to the Minnesota 28. Akrum Wadley capped off the drive with a 12-yard touchdown run to give Iowa an early 7-0. Just 2:23 had come off the clock. Then, as quickly as it had showed up, the Iowa offense disappeared. Seven more drives ensured for Iowa in the first half. They resulted in five punts, four three-and-outs, an interception on the first play of a drive, and a fumble with 44 seconds left in the half. After going 80 yards on the opening drive, the Iowa offense totaled just 86 yards of offense the rest of the half. On the other side of the ball, the Hawkeye defense showed up yet again. They bent, but refused to break for the eighth straight game. Minnesota’s offense worked a couple of decent drives and got to within striking distance just twice. The Gophers attempted a fake run on fourth-and-goal from the Iowa seven, but Demry Croft overthrew his tight end Nate Wozniak and the defense forced a turnover on downs. Later, Josh Jackson tipped a pass intended for Rashad Still, and Jake Gervase came down with an interception in the end zone. The Hawkeyes got close to scoring again before halftime, but a James Butler fumble at the Minnesota 21-yard line halted the drive. At halftime, the score was a 7-0 Hawkeyes. Aside from the first five Iowa plays, the teams could not possibly have been more evenly matched. Even though the offense stumbled in the first half, the Hawkeyes came out of the locker room and put together another good drive to start the third quarter. Stanley led the Hawkeyes on a 67-yard drive and capped it with a 45-yard touchdown pass to Noah Fant. The deep ball nearly reached press box heights. Many fans could finally let out a deep sigh of relief after Stanley connected with Fant. At least once a week, Stanley seems to overshoot the big tight end on a deep route, but this time was different. Much like the first half, the Hawkeyes failed to get much else rolling after the first drive of the half. The next three drives resulted in three-and-outs. The Gophers finally found the end zone in the opening minutes of the fourth quarter on a one-yard touchdown run from Kobe McCrary. The score pulled the Gophers to within a touchdown. 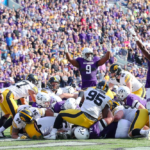 Miguel Recinos added a field goal for the Hawkeyes two drives later, narrowly connecting on a 32-yard field goal to make it 17-7 in favor of the Hawkeyes. On the next Gophers drive, Emmit Carpenter hit a 33-yarder to make it 17-10. The Gophers had one last shot with 1:21 on the clock, but Croft was sacked by Anthony Nelson on fourth down to secure the trophy game victory. Defense made the difference for the Hawkeyes yet again. The Gervase interception and two turnovers on downs stand out, but so too does the play of corner back Josh Jackson. Jackson entered the game with a Big Ten-leading 11 pass breakups and added four more in the victory. Jackson was targeted seven times and only allowed one catch for nine yards. On offense, the return of James Butler seemed to open up options for the offense as well. Butler rushed for just 28 yards on 11 carries, but having him allowed Wadley to stay fresh. Wadley finished with 70 rushing yards and a touchdown. Moving forward with a little bit of momentum, the Hawkeyes (5-3, 2-3) will have tough tasks each of the next two weeks. First, Ohio State will come to Kinnick, fresh off an impressive, comeback victory over second-ranked Penn State. 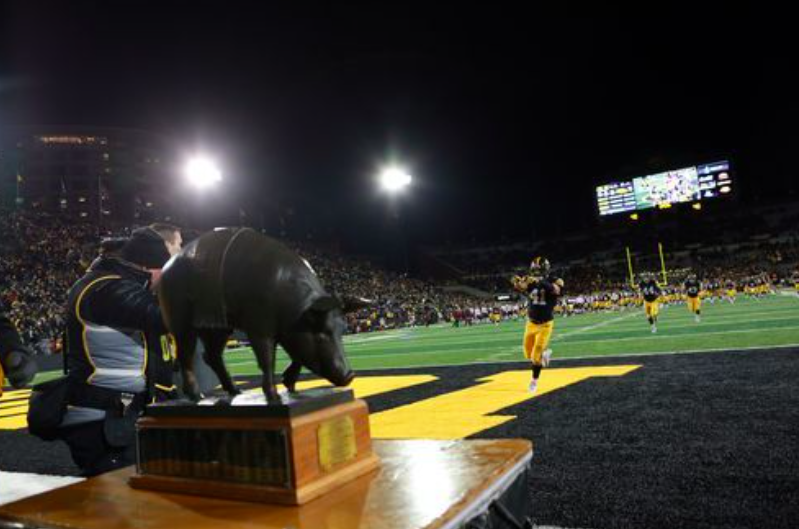 Then, the Hawkeyes will travel to Camp Randall to play a likely 9-0 Wisconsin team in the Heartland Trophy game. Game time for next week’s game against the Buckeyes (7-1, 5-0) is set for 2:30pm and can be seen on ESPN networks.